A new game from Emanuele Ornella and Mind the Move is something of an event. I still have fond memories of discovering Oltre Mare (Winter 2005 GA Report) over pizza in central Essen a few Octobers ago. 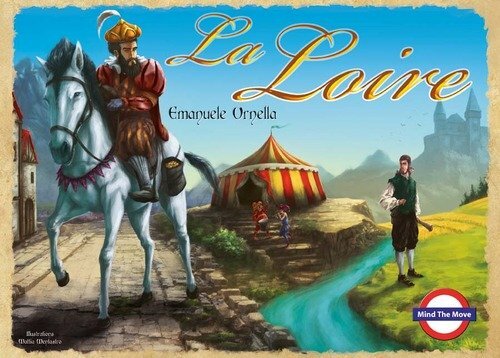 I was thus pleased to find Mind the Move back at Spiel ’12 with a new game from Ornella, La Loire, published in a numbered, limited edition by Mind the Move in Italy. 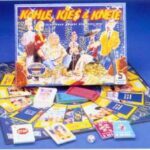 It is a board game for 1-4 players (yes, there’s a solitaire option). 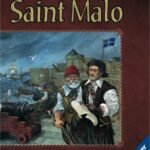 The game is intended to reflect the concurrent rise of the merchant class and the postal service in 16th century France. 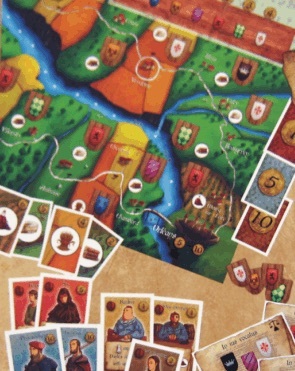 The eponymous river is a central feature of the four-piece board, running from the city of Orléans in central France (bottom right corner of the assembled board) to reach the Atlantic at Nantes (top left corner). The river itself is a scoring track. 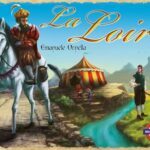 Players move their pieces along the two roads that wind their way from one city to the other – one on either side of the Loire. They use their merchant to buy and sell goods, generating money to buy things, notably messages for their messenger to deliver and score points. As you’d expect, the player with the most points at the end of the game wins. The most striking thing about the board is that there are pieces to punch out of it! The land either side of the river is divided into regions, each with a village that produces one of the four goods and has a particular heraldic shield. The shields are removed and distributed at random at the beginning of each game. They link the villages with the price track at the top right of the board. The price track markers indicate the current price for buying goods at the village(s) with the same shield. So, if the red shield is against the price ‘2’, it costs two deniers to buy goods at any village with a red shield (there are four of these). Goods are represented by cards with the selling price printed on them. Thus if that red village produces wood, this may not be a good buy as it only sells for two. However, a red village that produces wine looks a better bet as wine sells for six. Money is also cards and comes in several denominations but mainly ‘1’s. Whenever a good is bought, the appropriate marker is moved to the right-hand end of the price track, where the price is highest. Of course, this affects the price at all the villages with the same shield and it’s entertaining if you can do this to put up the price for the good another player was about to buy! Players start the game with their merchant, a wooden pawn, in Nantes, and their messenger, a wooden cube, in Orléans. They also have a wooden disc in their chosen colour, which goes on the zero space of the scoring track (the river) for points scored during the game. Two smaller cubes are apprentice messengers and are set aside for the time being. Finally, players have four wooden houses – farms that can be built in villages – and a church-shaped piece which upgrades a farm to a monastery. In their turn, players move their merchant and their messenger in either order. They move one region plus one for each horse (white disc) they are stacked on top of. All pieces start on top of two horses with some spare horses distributed around the villages on the board. Before moving, players can add one horse to a piece, if there’s a spare in that region and they don’t already have two horses, or leave behind any number of horses. Horses tend to get scattered about the board, but I recommend thinking hard before you take the last horse from one of your pieces. Moving without any horses is very slow! When a merchant ends its move in a village, the player may buy a good if they have enough cash and don’t already have that good (though they can have more than one wood). When a messenger ends its move in a village,the player may deliver a message. Messages are represented by cards and come in four sets, costing 1, 2, 3 or 4 deniers to buy. Level 1 messages just have to be delivered to a named village. They are worth two points (at the end of the game) and also provide some cash (the current market price for the village they’re delivered to). Level two messages show two shields and the messenger must visit one village with each shield – in either order. This requires the assistance of an apprentice (small cube) which is left at the first village visited and retrieved when the messenger arrives at the second one. Thus you can’t deliver these until you’ve hired an apprentice. The points value of these messages varies according to the rarity of the two shields on the card but you don’t get any cash for them. Get a card with a black shield on and it’s worth more points because there’s only one village with a black shield. 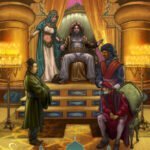 When a merchant arrives in one of the cities, the owner gets busy. First off, they sell any or all of their goods. Then they may buy one building, which I’ll come back to in a moment. Finally, they may convert cash to victory points, scored by moving their disc along the river. 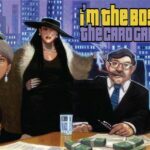 One point to note is that players need to keep at least 5 cash or their merchant cannot leave the city! If you start a turn with your merchant in a city and less than 5 cash, you must draw one cash and pass. Conversely, if you have more than 10, you lose the excess when your merchant leaves town. Now, back to buying buildings. There are two types of buildings. The first are represented by the players’ wooden pieces. They cost wood and cash, are placed in a village and don’t score any victory points. A farm goes into a village without a building. It gives any merchant who buys goods in that village a discount of one off the price (yes, goods can be free!). However, this scores the farm’s owner a point (moving their boat along the river). The owner can buy a message (level 1-3) when his messenger lands there. A player’s monastery replaces one of their farms and provides the same discount and victory point as a farm. As already noted, it lets the owner buy a level 4 message. In addition, the owner’s merchant can buy a barrel of beer. This costs the usual amount but sells for a whopping ten deniers. A castle is an upgrade for a farm and is shown by adding a tower (white wooden cylinder) to the farm. This gives a bigger discount for merchants who buy there and I’ve yet to see anyone bother to build one! Building a farm or two is generally a good idea. Players will use them and give you points – especially if you place them in villages that produce the more valuable goods and are handy for merchants leaving or approaching a city. Because of this, the earlier you buy farms, the better. Best of all, you can use them yourself, gaining both the discount and the point! They give some flexibility for your messenger, too, by providing an alternative source of messages, but the bonus points are the most useful thing. 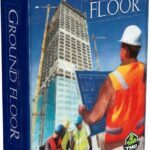 The second type of building is represented by cards. These are the Palace buildings: four different buildings with two of each available in each of the cities. You can only buy a Palace building in the city where your merchant is and it just costs cash. It gives you a bonus (such as 3 deniers every time your merchant and/or messenger lands in the appropriate city) and is worth a couple of points at the end of the game. How can you say no? Well, it’s a hard decision whether to buy these or farms first – though if you don’t have any spare wood, you won’t be buying any farms. The other thing that stops you buying a building is the need to have cash in hand to buy goods and messages (there’s a practical reason for that 5-denier minimum on leaving a city). Okay, you can begin to see how the game goes. Your messenger scurries back and forth (being unable to turn round can be a real pain!) picking up and delivering messages to generate points. Your merchant trundles along, picking up goods and generating the cash to buy buildings and pay for those messages. Each player starts with a little cash and a message and will gradually build up their holdings until they’re awash with cash and delivering messages all over the place. Hopefully. The game ends either when someone’s boat reaches a specific score on the river (depending on the number of players) or someone’s delivered a specific number of messages (ditto). Players get points for their palace buildings, messages (undelivered ones get a point) and their score on the river – cash and goods are irrelevant. And whoever has the most money wins. Except that I haven’t told you about a major element of the game yet: the characters. There are 29 different characters available for players to hire, each providing some sort of discount or bonus during the game and points at the end. There are enough of some of them – such as the Apprentice, which players need to be able to deliver higher-level messages – for every player to have one. However, there are only two cards for most of the characters and a few are one-offs. Clearly, there is a lot to be gained over the course of the game by having the right characters. Equally, there’s a lot to learn and your first few games are likely to be quite slow as people keep going back over the character cards to see what they do. The characters come in five groups and are colour-coded. The red characters help with messages. They include the Apprentice, which I’ve already mentioned, and the Mayor, who lets you hold more than two undelivered messages at a time. Green characters help with movement. I have found the Blacksmith quite useful. He lets you pay a denier to take a spare horse from anywhere on the board. As there are two of these, the player who doesn’t have one in a three-player game is at a particular disadvantage. Not just because the other players can always grab a horse, but because they will pinch the one the third player wanted to pick up! Brown characters give discounts. A good first character to take is the Witch as she provides a discount on all future characters. The yellow characters are about goods. They either let you carry more than one of the same good or add to the selling price (wine merchant, cheese merchant etc). A good option is to get both for the same good. This set also includes the Banker, who lifts the limit on cash held when leaving a city to 15 instead of 10. Finally, the blue characters each provide a bonus for a different type of message (shown by an icon on the message card). While characters are very useful, hiring them can be tricky. To do this, you must visit the circus. At the start of the game, the circus (a pink wooden ‘big top’) is placed on one of the villages. Players can hire one character by landing their merchant or messenger (or both) on the village with the circus. They have a free choice of character, assuming they can afford the one they want and haven’t already hired one. However, the thing about circuses is that they move around. At the start of the game, the price track marker that matches the shield in the village with the circus is flipped over to the side with the ‘big top’ icon. When this marker reaches the mid-point of the price track (also marked with the big top as a reminder), the circus moves to a village whose shield matches the one at the head (most expensive) of the price track and both markers flip over. The current player chooses the village if there are several with this shield (usually the case), which can be a useful tactical bonus. As you’ll understand, getting to the circus is important. It’s the only way to hire characters (though one of the palace buildings allows you to hire red characters in a city) and you need the bonuses characters provide if you’re going to win the game. The circus always starts two moves away and it’s perfectly possible that it will have moved before anyone reaches it! You need to keep an eye on the price track, since there’s nothing more galling than manoeuvring to get to the circus only to have someone else sell something and shift the circus as a result – usually just behind you! Okay, that’s the full complexity of the game. 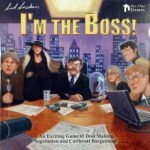 The rules suggest that you can play without the character cards but I think that robs the game of a lot of its flavour and options. However, it might be worth doing as your first game, allowing players to get to grips with the mechanics of play without the delays of studying the character cards. 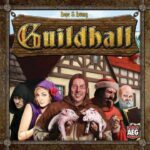 With the characters in play, it will take a couple of games for people to get to grips with all the options available to them. 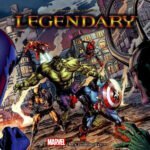 While it seems that the characters add a lot of complexity to the game, I would argue that they are relatively straightforward. The real complexity is in the tactical decisions each turn and weighing up the options: where to move to, what to buy, how the prices are moving, what that positions you for next turn and what the other players are going to do in the meantime. Having said that, there is a considerable luck element in the game while you are taking messages at random. Get a message that has to be delivered to the village behind you and it will take a while. Pick one for the village in front of you and it’s easy. This makes the character and the Palace building that give you some choice of message really useful. As one of the game end conditions is delivering so many messages, a strategy suggests itself. Deliver just the easy, level 1 messages and hope to end the game before anyone else has accumulated many points in characters and buildings. This is helped by gaining cash when delivering level 1 messages, so you don’t need to rely on trading for the cash to buy more messages. However, I’ve yet to see this work. I think it’s because, in practice, level 2 messages are just as quick to deliver as level 1 and they are worth at least double the points. At only 2 points/message, you need a lot of level 1 messages to match a few level 2s. The obvious strategy of enhancing your position with characters and buildings and increasing the value of the messages you deliver seems to be the way to go. It’s then down to tactical choices between the players. While farms are useful, I’m not convinced that the monastery is worth building and, as I’ve said, I’ve yet to see a castle in play. Which characters you choose will depend on what you’re trying to do, but the Witch and the Blacksmith seem the obvious starting points. Oh, and you’ll need the Apprentice and Helper to deliver level 2 and 3 messages. 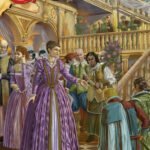 A mistake in the rules suggests that a merchant may be able to do more than one thing in a turn. 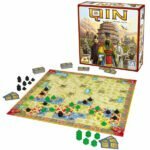 The designer has posted a clarification on BoardGameGeek: at a village a merchant or messenger can do one – and only one – action. Thus, a messenger can deliver a message or buy a message or hire a character (if at the circus). There’s also what appears to be a printing error on the board. Generally, the terrain in a region matches the good it produces. Except in one case (Vendôme) where cheese is shown in a wheat field. If this region in fact produces wheat, there would be fewer regions producing cheese than wheat, which fits with cheese being worth more than wheat. There is no confirmation of this from the designer, but this is the way I play the game now. La Loire has some very interesting mechanisms. In general, they mesh together nicely. However, I have found a few clunky bits – things that seem to have been bolted on to fix a problem (such as the fact that only level 1 messages provide income – I suspect this is in response to money being tight in the early stages of the game). Nevertheless, I’ve been having a lot of fun playing La Loire. It did take a few games to get my head round it, but now I can concentrate on trying to win! And I intend playing it quite a bit more. It gets 8/10 on my highly subjective scale.